So, Ive been in the dark ages... Yep... last Wednesday night I lost my internet... but it's finally back!! Today is day 4, so I have 3 days to show you. Please bare with me lol!! OK - so again, bare with me. I am so behind on review posts too; so you will be getting a review later today as well. That's right, its a two-post kind of day. Tomorrow will be too!! And I have 3 more reviews to do too! Bad time for my internet to go down lol. Day 2: Snowflakes. Those of you that follow me on Instagram got to see this on Friday (if you aren't following me on Instagram and want to be, go here). The base for this nail art is Candii Polished Let It Snow; which is one of the polishes you will see in my review post later today. I used my white Stripe Rite to draw the snowflakes, and went over them with the clear glitter Stripe Rite. It doesnt show in the pic, but in person the glitter really makes it pop! Day 3: Christmas Movie. I love, love, love, love Dr. Seuss. I grew up reading all of his stories (my favorite was Marvin K Mooney Will You Please Go Now. I could recite it by memory when I was little!) so my first thought was How The Grinch Stole Christmas. It was a bit out of my artistic skill set, but I decided to go for it!! It took forever to do the Grinch, so I left it at him lol. The Grinch himself is my LA Art Deco Striper in mint green (their names are all messed up. Its clearly lime green haha). The black outline is my Stripe Rite, his yellow eyes are my Orly Striper in Yellow Submarine, and the red dots were my red LA Art Deco. 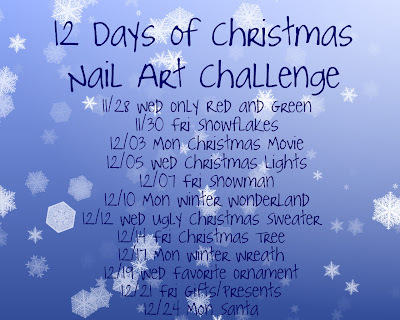 I painted the rest of my nails with China Glaze Merry Berry and Glistening Snow from their Holiday Collection. Day 4: Christmas Lights. I was in a rush for these, and am not totally happy with them... but alas, I did not have time to redo them. I wanted to do something different from the standard Christmas light manis you see, and since we outline our house with icicles (and then cover the rest of the house with lights so you can see it from space... my hubby has an illness. He cant just put one strand up; he has to put them all lol), they seemed fitting. The base is Barielle's Coalest Day of the Year. It is absolutely gorgeous, I liked it much better before I used my white Stripe Rite to add the lights haha. OK.... so glad to be caught up on my nail art!! Dont forget to check back at noon pacific time for my Candii Polished review!! All of these are awesome!!! Glad we got to see them for sure!!! Great manis!! 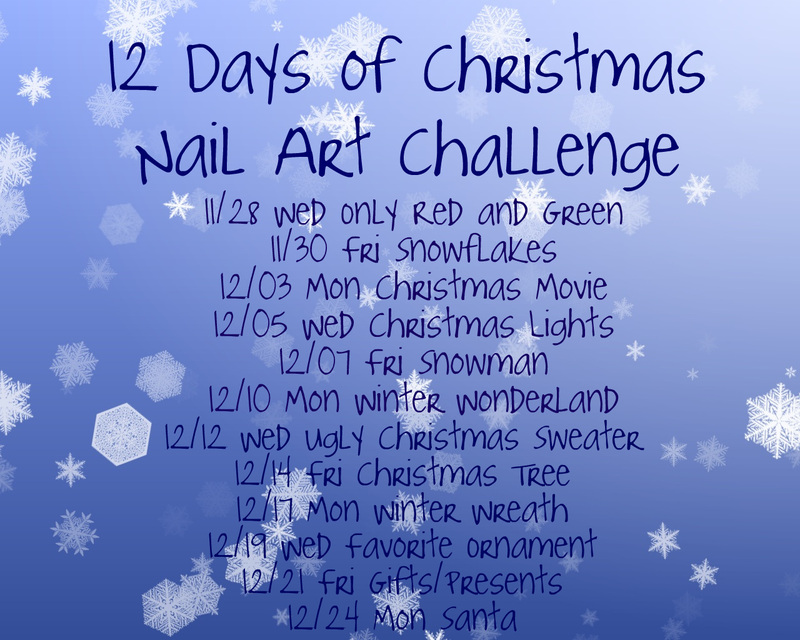 Your Grinch nail art is amazing!! OMG LMAO I love your Grinch hands down awesome!! I totally love The Grinch. That has always been my favorite Christmas program ever. Not the Jim Carrey movie though, the original animated one just like you painted. BTW, awesome job on his face. You are very talented with paint and brushes!